A group of trekkers Passing Thorung La pass 5416m. The round Annapurna trek is the popular trek in the Annapurna mountain range north of Pokhara Valley second biggest city of Nepal . In this trek, we follow two major rivers Marshangdi and Kaligandaki river gorge one of the deepest goerge in the world and pass an altitude of-5,400m on the Thorung La pass and a walk of around 300 km. This round annapurna trek can be done in either way. 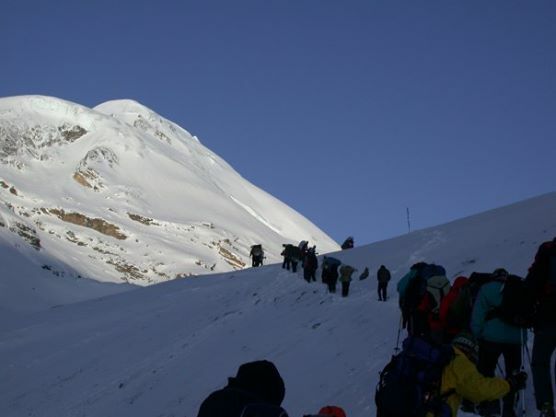 It encircles the Annapurna Massif, crossing Thorung La [5416m], the highest pass on this trek. The magnificent mountain scenery includes Annapurna , Dhauligiri, Machhupuchhare, Manaslu, Gangapurna [7455m] and Tilicho Peak [7134m].